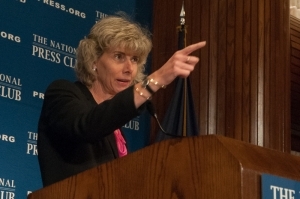 Nuclear Regulatory Commission chair Allison Macfarlane gestures to make a point at the Nov. 17 Club Luncheon. Nuclear Regulatory Commission chair Allison Marfarlane told a Club Luncheon Nov. 17 that  new regulations were needed to better ensure nuclear power safety, including those surrounding spent fuel storage, transportation, disposal; and the decommissioning of nuclear power plants. She also said the commission needed to work with foreign countries, sharing its expertise to make sure those plants were safe. “Nuclear power is viewed in some of these countries as a source of prestige, and often a fledging regulator will have trouble keeping up with its government’s ambitious construction plans," said Macfarlane, who has chaired the commission since 2012. "In particular, I’m concerned about nations that seek nuclear power capabilities without building the necessary indigenous expertise and regulatory infrastructure to ensure that construction and operations are performed both safely and securely." She said the commission and the nuclear industry needed to continue making safety improvements in response to the meltdown at Japan’s Fukushima Daiichi nuclear power plant, caused by the March 2011 earthquake and tsunami. “Much has been done, but our joint challenge is now to keep up the momentum, maintain our commitment, and ensure that the lessons of Fukushima are memorialized in a sustainable way in our day to day work,” Macfarlane said. She said she visited Fukushima after the disaster, a trip that further highlighted the need for stronger safety measures. “Traveling through deserted villages, with weeds overtaking parking lots and thick layers of dust settling on artifacts of hastily abandoned lives, I came to better understand the societal costs of nuclear reactor accidents,” she said. Macfarlane said last year's government shutdown, as well as the Fukushima disaster, threw new challenges at the NRC. “The predicted nuclear renaissance did not materialize in the United States and unplanned work resulting largely from Fukushima and waste confidence resulted in resource limitations that had a real impact on the staff’s ability to manage its ongoing workload,” Macfarlane said.